So, this is the real reason why Elena Dementieva lost so early in the US Open. 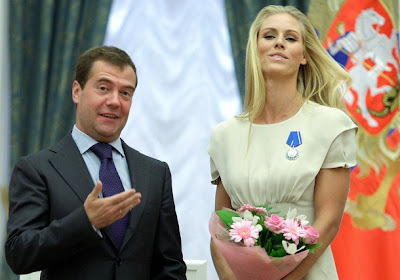 She was back in Russia to accept the Order of Honour by the Russian Federation presented by President Dmitry Medvedev. 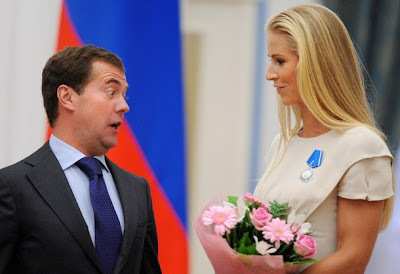 The president is wowed by the medal... I guess. You can see, I'm asking for it very nicely. 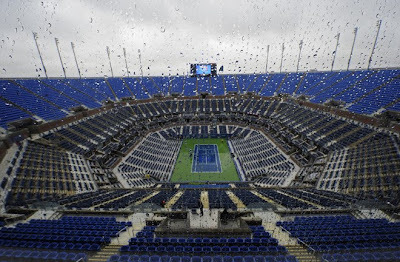 The showers continued at Flushing Meadows and this time nature has forced the postponement of all of Friday’s three scheduled singles matches which also included the suspended quarterfinal match between Rafael Nadal and Fernando Gonzalez. Also delayed are the two women’s semifinals, one between Serena Williams and Kim Clijsters, the other between Caroline Wozniacki and Yanina Wickmayer. Those three matches were all rescheduled for Saturday and set to have Nadal/Gonzalez begin at noon, followed by Wozniacki/Wickmayer, with Williams/Clijsters slated to start after 8PM. Assuming the women’s semifinals can be completed Saturday, that final will be moved to Sunday. 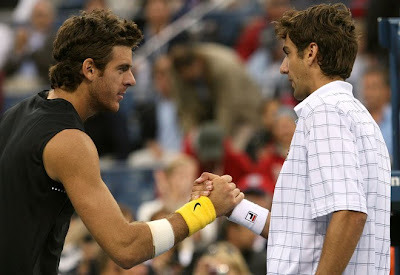 If Nadal/Gonzalez finishes Saturday, the men’s semifinals will be Sunday. This means the men’s final then would be moved from Sunday to Monday. 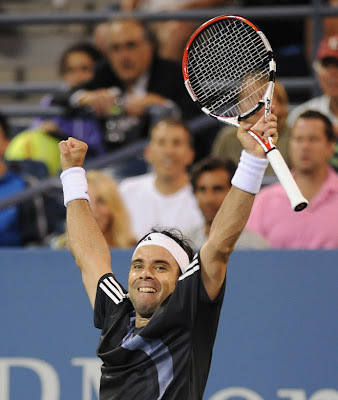 If you remember last year, the US Open men’s final was played on a Monday for the first time in many years. 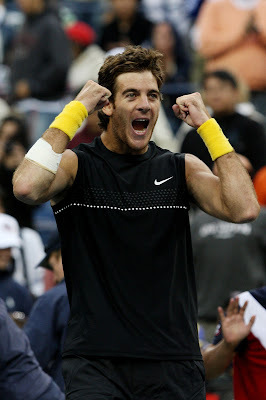 Juan Martin del Potro has to wait for another day to know who he's going to play in the semifinals. 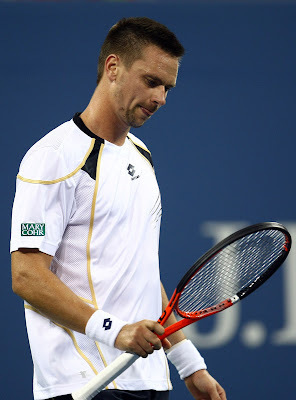 This is because the quarterfinal match between Rafael Nadal and Fernando Gonzalez was postponed after a series of interruptions due to showers during the second set. Nadal is currently leading 7-6, 6-6 and 3-2 in the tiebreak. This break might be helpful to Nadal, who called for a trainer in earlier set due to stomach muscle problem that bothered him since earlier of the tournament. 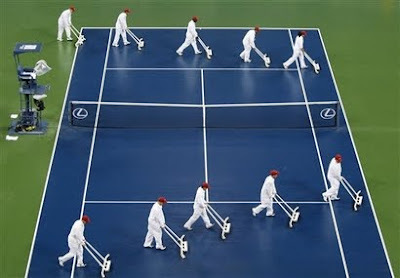 Their match was scheduled to resume tomorrow (not before 2PM) — following the first women’s semifinal, between Serena Williams and Kim Clijsters, which was to begin at 12:30PM. 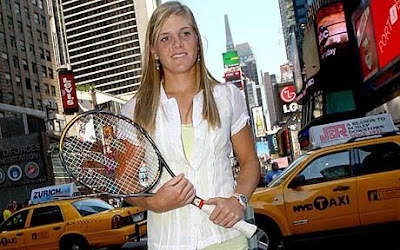 It's curtain call for Melanie Oudin at the US Open but as she stepped out of the Arthur Ashe stadium last night, her life will change forever - as the media said, she'll step into "a world of jostling paparazzi, autograph signing and an endorsement-filled future". Caroline Wozniacki who ended Oudin's dream run with a 6-2, 6-2 victory, will go into her first Grand Slam semifinals for the first time. In an earlier quarterfinal match, Belgian Yanina Wickmayer, who never before past a Grand Slam second round, beat Ukraine's Kateryna Bondarenko 7-5, 6-4. 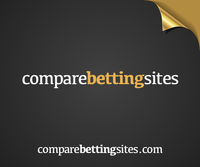 Both Wozniacki and Wickmayer will meet in a Friday semifinal to determine the winner to play for a US Open title on Saturday against either Serena Williams or Kim Clijsters. 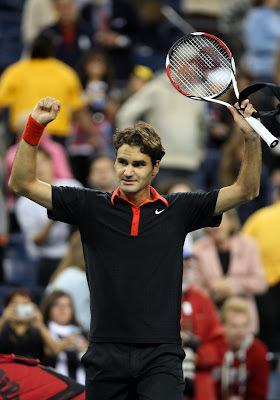 In the men's singles, Roger Federer defeated Robin Soderling 6-0, 6-3, 6-7, 7-6 to extend his winning streak to 39 at the US Open. Federer will play Novak Djokovic in the semifinals, after the Serbian pulled off a 7-6, 1-6, 7-5, 6-2 win over the unfit Fernando Verdasco. According to tennis.com, Fernando Verdasco will miss Spain's upcoming Davis Cup tie to allow an abdominal injury to heal and have surgery on his foot.
" I have micro tears [in the abdominal], and tomorrow I have proof to know how long I need to rest, to recover. 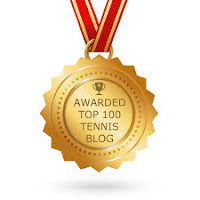 But I think it's going to take around one week or ten days," Verdasco said. "So in that time, I will take that time also to have the surgery on my foot." Does that mean Verdasco would not be able to recover in time for the Malaysian Open scheduled to take place end of this month? Novak Djokovic is all out to win America's heart. 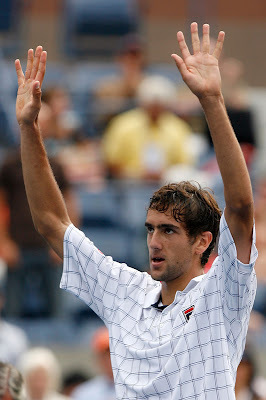 He invited children of 9/11 victims to watch his matches in his box. "We had this idea before the tournament, and I didn't want to talk about it, obviously." "Well, it's a gesture that I hope it means [something] for them. I've been meeting four different guys in these two weeks. I have been giving them some presents after the matches." "I just try to bring some smiles and make them enjoy. I hope that's what I did." You know you're famous when people want to know about your private life. That's happening to Melanie Oudin. Still about, Melanie Oudin, she just signed a multi-year endorsement deal with technology company BackOffice Associates, who also sponsors James Blake. According to AP, 'disappointed' was the word Andy Murray used over and over to describe how he felt about his exit from the US Open. 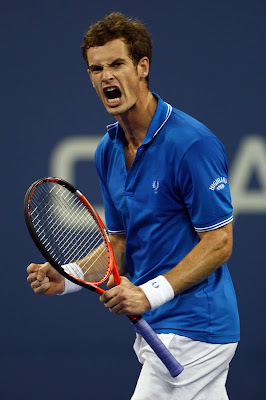 Coming in to Flushing Meadows as seed no.2 and one of the top contenders for the US Open title, Murray was upset by Marin Cilic 7-5, 6-2, 6-2 in the fourth round. Stay tune for Day 9 wrap-up later. 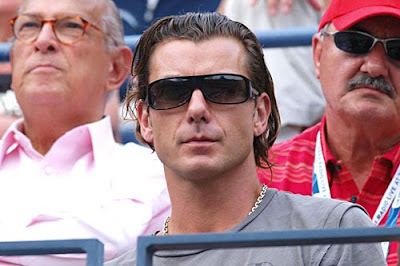 Coincidentally, after posting about the lack of star power at the US Open, we begin to see more celebrities in the second week. 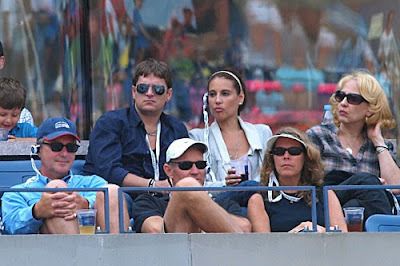 Here are some of the celebrities who attended Day 8 matches. 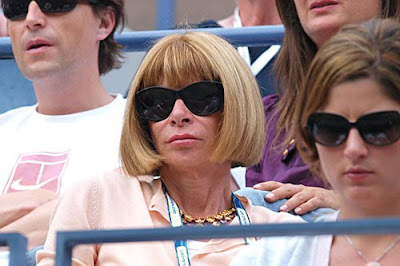 Just like last year, Nicole Kidman and Keith Urban are not here for tennis. 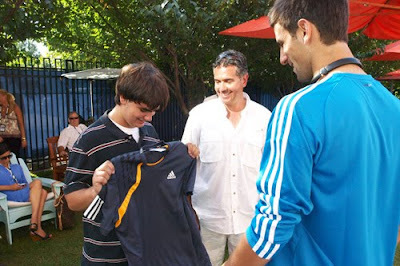 And speaking about celebrities, Novak Djokovic is a star of his own. 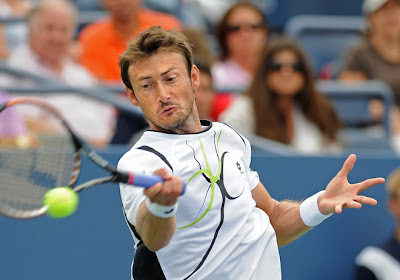 He has impersonated Maria Sharapova, Rafael Nadal and others in the past. 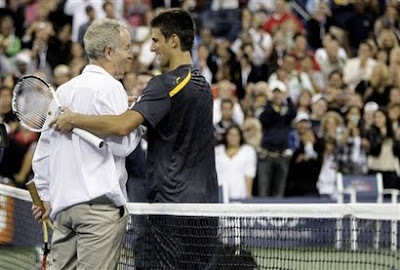 Last night, Djokovic added to his repertoire of memorable impersonations by channeling his inner John McEnroe in front of the majority-American crowd. 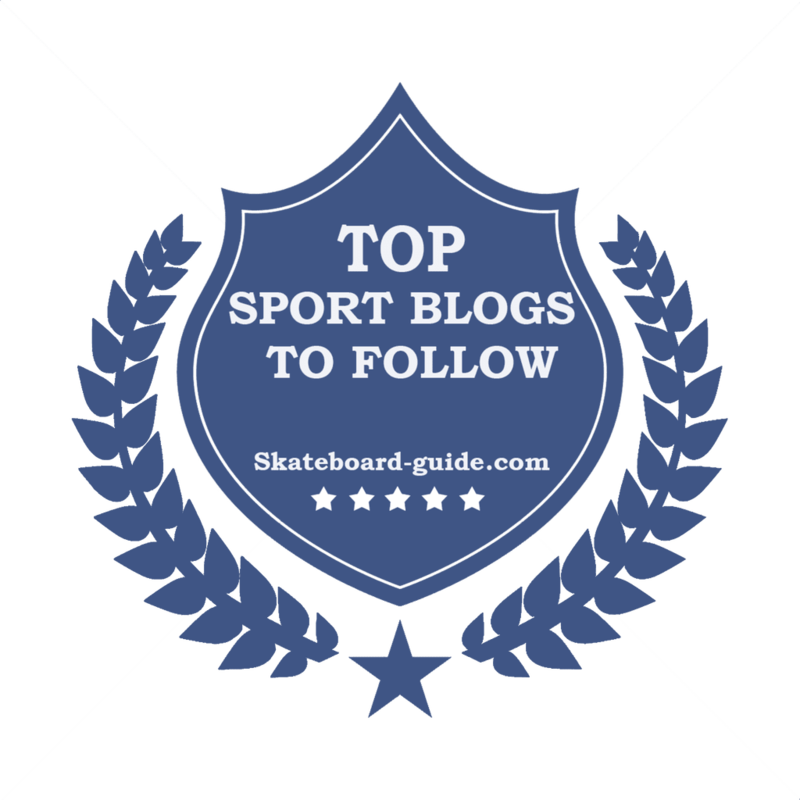 Check out the video here by tennisnakama. Earlier Djokovic defeated Radek Stepanek 6-1, 6-3, 6-3. There was another thing for the American crowd to cheer about last night. America's newest darling, Melanie Oudin, continued her dream run at the US Open with another upset over Russian Nadia Petrova. The teenager won 1-6, 7-6, 6-3. The biggest upset of the day has to be Caroline Wozniacki who sent off Svetlana Kuznetsova. The Danish teen toppled the former US Open champ 2-6, 7-6, 7-6 to reach her first grand slam quarterfinal. American John Isner’s 4-6, 6-4, 6-4, 6-4 defeat to Fernando Verdasco marked the first time since 1968 that no American men's players advanced to the US Open quarterfinals. I remember very well that in the last couple of years, there were quite a number of celebrities who added glitter to the US Open every single day. So what happen this year? Besides Alec Baldwin, Will Ferrell, Kim Cattrall, Patrick Stewart, Jason Bateman and Jennifer Love Hewitt, I haven't really seen any hotter stars than those I just mentioned. Celebrities aside, I think the player of the day is Kim Clijsters. 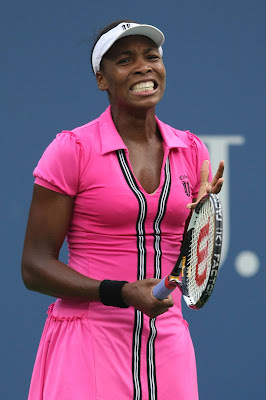 Clijsters marked her dazzling return to the grand slam by ousting Venus Williams with a wild yet weird 6-0, 0-6, 6-4 victory! The Belgian mum will face Li Na next after the Chinese beat Francesca Schiavone 6-2, 6-3. In another exciting match, Flavia Pennetta saved six match points to advance to the quarterfinal with a 3-6, 7-6, 6-0 victory over Vera Zvonareva. 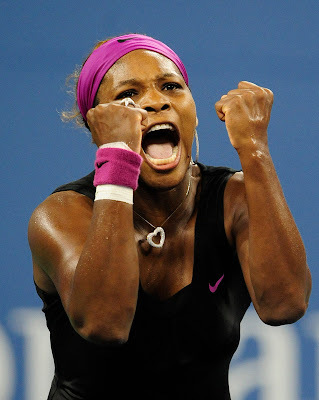 Pennetta will face Serena Williams next! 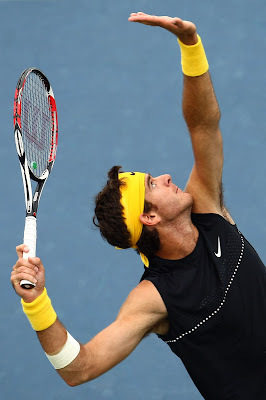 In the men's singles, Andy Murray joined Juan Martin del Potro, Jo-Wilfred Tsonga, Juan Carlos Ferrero, Rafael Nadal and Fernando Gonzalez to the next round. Earlier of the day, Nadal knocked off compatriot Nicolas Almagro 7-5, 6-4, 6-4. During the match, Nadal was treated for a stomach muscle problem while Almagro also received a treatment for back problem. Nadal's next opponent is Gael Monfils who advanced when Jose Acasuso quit because of left knee pain while trailing 6-3, 6-4, 1-0. 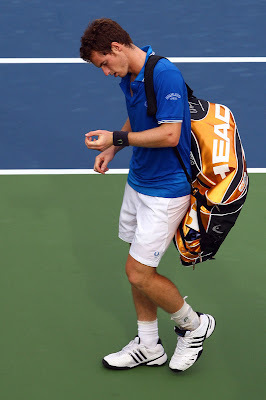 In the last match of the day, Murray, needed only 90 minutes to sent off Taylor Dent 6-3, 6-2, 6-2 and set up a fourth-round encounter with Marin Cilic.